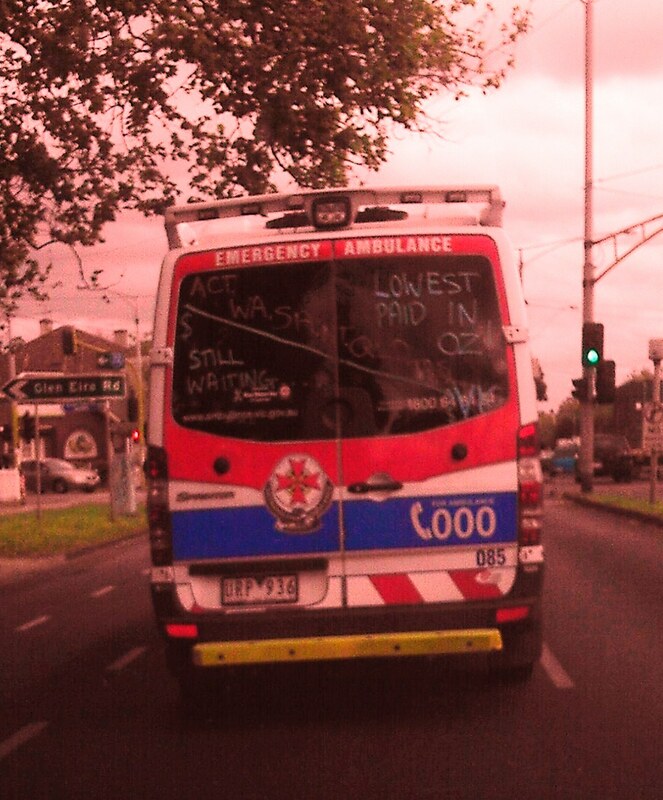 Anyone driving around Melbourne would’ve seen Victorian Ambulances, all covered in signs indicating that our Ambos are the lowest paid in Australia. It is all part of an ongoing dispute between ambulance workers and Victorian government. Ambos are claiming they are the best trained but lowest paid for their duties in the country. Yesterday, as I was letting one of the emergency vehicles overtake me, I decided to check out how much they actually get paid, and what do they ask for. Figures themselves are not too exciting. There are dozens of articles on a subject, some in support of the paramedics, some are clearly pro-government. Depending on the source, ambos are getting between $73,000 and $93,000 a year including overtime, and they want a 30% raise, to make their pay line up with that of their colleagues in other states. As far as I am concerned, this sort of demand is not unreasonable, these men and women work day and night, sometimes up to their elbows in other people’s blood, guts and vomit. But what really got my attention was an article in the Herald Sun that went on to describe to its readers how good the ambos have it. The author was throwing in numbers, examples and quotes, all to prove that ambos are only working 11 days a month and therefore their claims of being overworked and underpaid are “not an emergency”. What the author failed to mention was the hidden “perks” of being a shift worker. Perhaps he is unfamiliar with what the word diurnality means (go ahead, google it). Or maybe he should have a look at a study published in the British Medical Journal last year, which concluded shift workers were 41 per cent more likely to suffer a heart attack or stroke. Or maybe, while he is having his soy latte in a morning, he would check out the study from Office of Road Safety of Western Australia – the one that determined shift workers are six times more likely to be involved in a fatigue-related vehicle incident. Alternatively, I can suggest he visits Victorian government’s Better Health website, where he will find that Shift Workers get, on average, two to three hours less sleep than other workers. They often sleep though the day in two split periods, a few hours in the morning and then an hour or so before going to work at night. Night workers can find it difficult sleeping during the day (particularly in Australia). It’s difficult to keep the sleep environment dark, free of noise and relatively cool. Now, I am not a whinger, but the author of that article not only having a go at our paramedics. By insinuating that they don’t work enough days, he offends, no-he disrespects, each and every one of Australia’s 1.4 million shift workers. I wonder if his opinion will change one day (or night) when he would have to use his mobile phone (24×7 service) to call Police or Ambulance, Fire Brigade or Nurse on Call (all 24×7 services)? This entry was posted in Australian politics, Health, Local Issues, Media and tagged ambulance, business, emergency, health, Media, politics, shift work, victoria by Eugene. Bookmark the permalink.